Whilst I've been away I've had my fingers in glue and paint. And my patience tested more than once. Roden model kits, who reside in the Ukraine, have a range entitled 'The Music Series'. Releasing mainly Boeing 720's in 1:144 scale. The infamous Starship 1 was released last year in it's gold/brown scheme, alas with no Elton version. However, all that changed recently. Anybody familiar with the general music scene of the 70's will be very familiar with Starship 1. Luckily the good folks at Wikipedia have an excellent entry on it. Elton fans have particular reason to be fond of it, as we shall see. This later version of the Starship in it's iconic stars and RWB combo is a delight. The terrific flamboyant colour scheme which appeared in 1974 couldn't be more striking than the previous colour scheme which was just plain awful. Visually it's colourful, it's history equally so. Ah, the stories it could tell...if it hadn't been sent to the canner. I'm going to give a brief rundown on the kit and the obstacles I encountered and thankfully flew over. 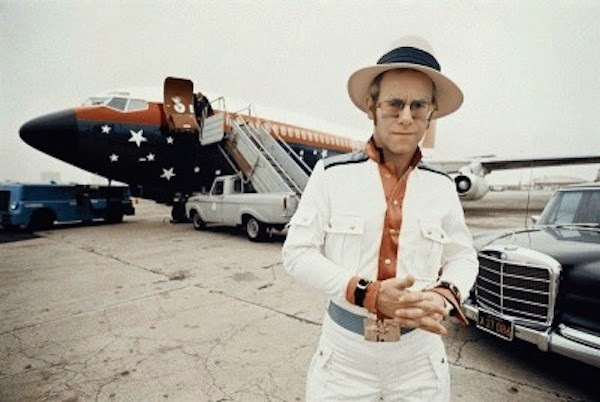 Not your usual entry on this blog, but it's all Elton related. In a good way! The kit itself is well moulded, very little filling or rubbing down needed. The plans were straightforward except for the main undercarriage. With the help of the interweb I was able to get the hang of the folding doors lark they were trying to describe. Painting was straightforward, the main colours of white and blue going on a treat. However, the main problem was with the red transfer stripe down the side. Patience, I nearly became one of those with shattered nerves!! First off it was too long. It's supposed to cover the windows and leave the glazing peeking through the clear holes on it. This didn't happen when I put the first one on. So I quickly had to remove it and cut it in to three sections. I then reapplied it, overlapping where neccessary to make it fit. So far so good. When it was in place I noticed another problem. It was too thin, colourwise. It didn't quite have the depth I'd have liked. The blue underneath which I had expected to be covered by the red stripe was waving through. So with Humbrol gloss number 19 Red I was able to touch up any dark patches. I then cut the red stripe for the other side into three sections again before I put it on and had no problems this time. The red stripe should be in a straight line under the stabilisers on the real thing, but it curves slightly on the model. I decided to leave it that way as it wasn't very noticeable. The band logo, reg number etc was very easy to put on. As were the stars, whcih I thought would be a pain. There's 30 big ones and 77 small ones. The smaller stars look a bit too small but they all went on very easily. The red tail transfer again was slightly too big. It stuck out a bit at the back but before it dried I was able to trim it with a scalpel. But it dried well and left no air bubbles. The overall colour scheme I chose was early on in the 1974 tour. Later on the tour the 'rainbow' effect on the front nose appeared. I could have done it on the model, but when I found a pic without it I decided to leave it off. Also during the tour the MCA Records logo on the tail was redone with a white background. Somebody was a bit finicity about the colour scheme. I know the feeling!! It seems it went in and out of the paintshop a few times in late '74. But at least it's accurate! Before I put the cockpit windscreen on, I put in ballast of 10 grams...or 4 one cent coins... to make the nose sit down. I glued the coins together in pairs, put masking tape over them and glued them into the front of the plane. With plasticard I made a bulkhead to stop them flying down the back of the plane and flattening Elton and the band. With the wings and stabilisers fitted, I then put on the main landing gear. I stuck them and before they went too hard put the plane down gently on a chopping board because it's dead flat and the plane's own wait made it sit naturally. The final part was my own creation, I uses the plasticard again to make the aerial for the top of the plane. They supplied one for the underneath but this one was missing. It finished it off nicely. Overall the kit was a challenge, but a rewarding one. The sheet that comes with it describing the colour scheme is a joke. Without Google I'd have been stumped. If I were doing it again...which I won't be... I'd paint the red stripe down the side instead and use the doors part of the transfer stripe. I'd have to use the red transfer that went around the cockpit as it's too hard to mark out. I'd maybe paint the tail also, but it came out better than I thought so I'd chance it again. The transfers are strong, they didn't break up or disintegrate. Little details like information about the silver on the wings and where the blue meets it from the fuselage was non existent. If you've some experience of making model kits, it can be done. I did it in a week...patience non existent again...but if you take your time you will get there. If you've never made any kit before...you've always got the box to look at. Because I wouldn't recommend any beginner tackling it. This is the link to the photo album of the plane under construction and this is a link to the photo album of the finished plane.